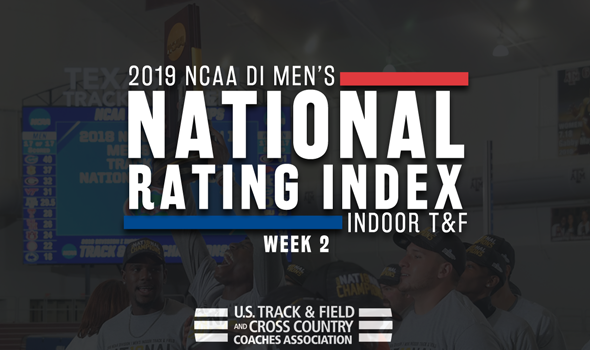 NEW ORLEANS – Strong performances across the board shifted the top-5 of the NCAA Division I Men’s Indoor Track & Field National Rating Index for the second week in a row. The most recent National Rating Index, released Monday by the U.S. Track & Field and Cross Country Coaches Association (USTFCCCA), shows Texas Tech still at the top of the chart, but behind it is now second-ranked Florida State, third-ranked Florida, fourth-ranked LSU and fifth-ranked Houston. The Red Raiders are the only team that didn’t move from Week 1. Speaking of Texas Tech, Wes Kittley’s team continues to take advantage of some delicious home cooking. The Red Raiders hosted yet another meet in Lubbock and stood out in a big way. Texas Tech received standout efforts from Andrew Hudson, Vincent Crisp and Jonah Koech at the Texas Tech Classic & Multi this past weekend. Hudson moved up to fifth in the TFRI Individual Rankings of the 60 with his time of 6.58, while Crisp and Koech both are in the top-8 of the 800 at 1:46.97 and 1:46.98, respectively. The Seminoles moved one step closer to matching their No. 1 ranking in 2010 by jumping up one spot from No. 3 to No. 2 this week. Trey Cunningham and Armani Wallace continued their strong seasons for Florida State this past weekend. Cunningham clocked a time of 7.53 at the Dr. Sander Columbia Challenge and is ranked No. 2 in the TFRI Individual Rankings, while Wallace bounded to a mark of 16.72m (54-10¼) in the triple jump and is listed fourth in the TFRI Individual Rankings in that event. The Gators dropped one spot in the rankings despite the efforts of Grant Holloway this past weekend at the Razorback Team Invitational. Holloway, who already owned a top mark in the 60 hurdles, added two other strong marks to his ledger in the 60 and long jump. The senior blistered the track to the tune of 6.51 in the 60 to move into sole possession of the No. 1 spot in the TFRI Individual Rankings in that event, while his long jump from last year at NCAAs is still better than the mark he turned in this past weekend in Fayetteville, Arkansas. The Tigers are back in the top-5 for the first time since Week 4 of 2017 and it’s not a coincidence that Mondo Duplantis had a heck of a clearance this past weekend. LSU’s prized freshman hit a mark of 5.83m (19-1½) this past weekend at the Razorback Team Invitational to move into a tie as the third best performer in NCAA history. Duplantis wasn’t the only one who shined for LSU this past weekend as its 4×400 relay clocked the sixth fastest time in the nation. The biggest movers in the top-25 this week were No. 9 Southern California, No. 15 Kansas State and No. 21 Akron. Both the Trojans and the Wildcats jumped 13 spots from Week 1, while the Zips vaulted 11 spots from No. 32 to No. 21. Kansas State owns its best ranking since the 2012 season and Akron is back in the top-25 for the first time since 2015. The last time the Zips were in the top-25, Shawn Barber was challenging collegiate records in the pole vault and four years later, Matt Ludwig is doing the same (Ludwig matched the aforementioned Duplantis with a vault of 5.83m). Be sure to check back in throughout the season as the National Rating Index will change a lot between now and March 9-10, when the 2019 NCAA Division I Indoor Track & Field Championships will take place in Birmingham, Alabama.